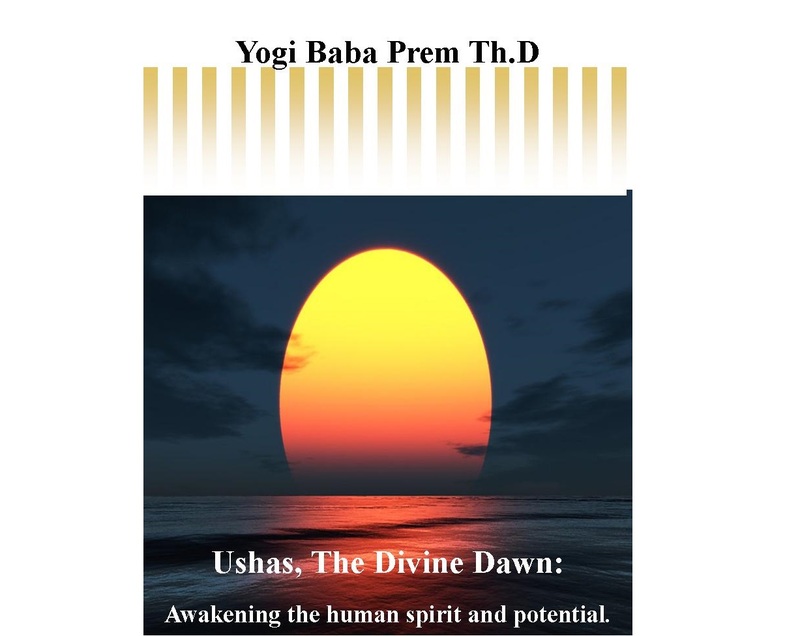 Ushas, the Divine Dawn: Awakening the human spirit and potential by Yogi Baba Prem is a timely, encouraging, and stimulating e-book offering in about eighty pages a useful survey of the famed Vedic deity from the perspective of Hindu dharma. Ushas, the Divine Dawn: Awakening the human spirit and potential by Yogi Baba Prem can be purchased from here. 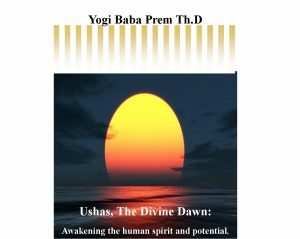 Ushas, the Divine Dawn: Awakening the human spirit and potential by Yogi Baba Prem is a timely, encouraging, and stimulating e-book offering in about eighty pages a useful survey of the famed Vedic deity from the perspective of Hindu dharma. It admirably succeeds in providing a nuanced assessment of the multifaceted, popular deity of dawn that goes back to ancient Vedic times. A remarkable thing about this enchanting e-book is that it is authored by an American scholar of Hinduism who was not born Hindu. It would therefore be useful to begin with the journey of the author toward dharma. Yogi Baba Prem received his Th. D (Religious Doctorate in Hindu Theology) in 2015. He is also a recognized Acharya (spiritual teacher) from the lineage of his guru Mahavatar Babaji. Furthermore, he is formally recognized as a Yogacharya by the American Institute of Vedic Studies directed by Vedacharya Vamadeva Shastri (David Frawley). Yogi Baba Prem (hereafter YBP; we are not told what his previous or formal name was) is the founder and director of Universal yoga (Vishva Yoga) affiliated with the American Institute of Vedic Studies. YBP is based in Altamonte Springs, Florida, USA where he offers a variety of programs, training and study options to beginner through advanced students coming from over seven countries. He brings to his teachings a deep study and practice of Yoga, Ayurveda and Jyotish as well as a clear understanding of the principles of Sanatana Dharma and the cultural heritage of India. In an interview with Yetta McGovern of YogaCurious, YBP explains what attracted him to Hindu dharma: His momentous journey began after he found an excellent home study course in Ayurveda and Jyotish (Vedic Astrology) offered by Vamadeva Shastri of the American Institute of Vedic Studies. YBP ended up studying with the Shastri for over fifteen years, which allowed him to explore the Vedic tradition in more depth and to deepen his understanding of the Vedic teachings. He realized that Hinduism or Sanatana Dharma was what he had been looking for all his life, and in essence it was what he was practicing all along in his engagement with the yoga studies. Immersing himself deeper into Hindu dharma provided answers; and more importantly, tools and a clarity in terminology that aided him in the explorations of the mysteries of the human nature. The earliest forms of Hinduism (Vedas), YBP told Yetta McGovern, provide a powerful glimpse back into the collective spiritual history, story, and knowledge of humanity. It was a different age then and the Rishis had powerful insights and realization into the nature of humanity. Each of us can benefit from their insight and tools contained within Hinduism, which challenges us to examine our existence outside of the box. Many non-Hindus, for instance, have issues with the concept and notion of the multitude of deities (male and female) due to their upbringing in other religions. But, if the idea of the deity is explained to them in a multidimensional way, says YBP, suddenly deities spring to life so to speak. In Hindu dharma, the deities represent the universal truth. Take Agni, the god of fire, for instance. Very few non-Hindus would recognize or relate to Agni as ‘a God of fire.’ But once it is explained to them that Agni is also the fire that digests ingested food (jatharagni) as well as the fire of ‘digesting’ mental thoughts and ideas (mano’gni) that ultimately allows one to ‘digest’ life experiences at different levels and make them meaningful; suddenly they realize that Agni has a great deal of relevance not just in my life or your life, but within each person’s life. By recognizing and understanding mental, emotional, and physical levels of the ‘digestive process’ supervised by Agni, one can experience greater health, vitality and joy. Agni (and other Hindu deities), therefore, have a great deal of relevance to humanity (adapted from here). Needless to say, YBP brings the same simplicity, yet clarity and profundity, to all his books including Ushas, the Divine Dawn: Awakening the human spirit and potential [hereafter Ushas], the short e-monograph under consideration here. Etymologically, Ushas comes from the Sanskrit verbal root vas, meaning to shine. Ushas being the dawn, she also represents the dawning or spiritual awakening of human beings; the shining light of spiritual awakening. This can mark the beginning of a greater inward journey towards spiritual realization. Many Vedic/Hindu deities have their own vahanas (mounts or vehicles) with each vahana having its own shakti or power. In most cases, a vahana can be approached just as the deity riding it. This would certainly be the case for Ushas, because Hindus deeply venerate the cow, one of her vahanas (the other being the chariot pulled by seven horses), which symbolically represents important spiritual qualities, one of them being light and rays of light. YBP refers to Rigveda 1:48.6, which depicts Ushas sitting at daybreak in a chariot pulled by seven horses. The term vajinivati (one with the horses) in this sukta is translated quite differently by different translators. Dr. R. L. Kashyap prefers to translate it as ‘possessor of many opulences.’ T.H. Griffiths translates it as ‘Rich in Opulence.’ Certainly, this would be a correct translation. Within the Vedas, YBP points out; one finds multiple layers of interpretation and understanding and proceeds to provide one of his own more expansive translations–‘steeds’ or a group of horses, especially in association with Surya (sun). YBP believes the association of steeds, horses etc. with vajinivati fits the overall positive and optimistic spirit of the Vedas. Furthermore, the number seven is identified with a variety of groupings of seven found within the Vedas and the post-Vedic Hindu civilization; for instance, the seven chakras. Ushas is the daughter of Dyaus Pitar (the Sky) and Prithvi Matar (Mother Earth; Avestan Zāmyād). She is the elder sister of Ratri (the Night) and replaces her younger sister before the Sun rises every day. The term ‘ratri’ literally means night, darkness or the still of the night. As sisters, one can compare and contrast numerous attributes associated with the dawn and night. For example, ratri (the night) represents ignorance, from which Ushas rescues humans through her light of knowledge. The paradigm of the relation between the elder and the younger sister as exemplified by Ushas and Ratri continues to be invoked up to the present times in Indian families where the younger sister is nurtured to respectfully give way to her elder sister. The elder sister, in turn, is taught and expected to show humility and to refrain from taking undue advantage of her position. Ushas and Surya (the Sun) have a complex relationship with Ushas paving the way to Surya, which is not only physically and literally true but spiritually true as well and observable during the interaction between the dawn and sunrise. In some suktas (verses), YBP points out, Ushas is the wife of Surya; elsewhere it is stated that Ushas birthed Surya: ‘…Surya was birthed [or brought forth] by Ushas…’ (Rigveda 7:78.3). Finally, Ushas is also associated with Ashwins, as the wife and the healing power (shakti) of the Ashwins, primordial physicians. While many scholars have written about the ancient Greek, Roman, or Avestan counterparts of Ushas (Eos, Aurora, and Ushabami respectively), YBP also alludes to the possible connection of Ushas with the Indus Valley Civilization on the basis of a bronze statue labeled ‘Dancing Girl.’ The theory is that this statue matches the image of Ushas, who is described in the Rigveda as a dancing girl. YBP cautiously observes that the dancing girl analogy would align with many symbolic interpretations, including the formation of matter and the activity of matter on a molecular level based upon some interpretations of the Vedas at the adhibhautic (YBP has it as ‘adhyabhutic’) level (See Roy 1999). Any aspirant who rises at dawn to chant and to meditate on Ushas is referred to as an Usharbudh (YBP has it as ‘Usharbhud’), which literally means one awakening with the morning light. YBP points out that since an internal dawning can or does occur at all times of the day and night as one awakens to a greater realization, an association of human beings with Ushas is not limited to the pre-dawn hours exclusively. Sam Kerr (a blogger based in Australia who writes on Zoroastrian matters) notes that in the Rigveda, Ushas is the only female divinity to whom entire hymns are devoted (twenty in fact) totaling one hundred and seventy six riks (stanzas), which are deemed to be among the oldest known compositions in the Rigveda. These riks are unparalleled in lyric beauty, depth of literary description, and poetic fervor. No prose or poetry, no painting or photograph, it has been said, has rivaled the beauty of these Ushas suktas (Kerr 2010). YBM provides useful translations of select riks from this cluster of suktas on Ushas in the Rigveda. While readily acknowledging that his translation can be controversial the author nevertheless believes it to be more applicable to the needs and understandable within the horizon of the spiritually oriented modern reader. Ushas inspires all those assembled refreshing them with her rays. In the Krishna Yajur Veda Taittiriya Samhita (4:3.11), Ushas is noted as the first dawn within the earth’s system, meaning that she supports all life forms on the earth; three great powers–Agni, Surya, and Chandra (fire, sun, and moon; the three great luminaries of this world) support her in this task. A common concept within the Vedas is the need for successive dawns in the process of spiritual growth and realization, an idea that is also supported in a variety of different systems such as the yoga. The seeds of truth (known as ritam in the Vedas) or realization are planted within us by Ushas, which the aspirant is expected to nurture by knowledge and intuition generated by his/her personal practice, study, and application of the teachings recorded in the Vedas. Through her mantras, she grants right thinking. To YBP, it thus becomes clear that Ushas is at the heart of Hindu dharma and ritam as well as for understanding the practice of Hindu dharma. The entire second half of his monograph on Ushas accordingly is devoted to elucidation of the basic principles of dharma. The Vedas remind us that Ushas awakens first and rises earlier than anyone (a virtue emphasized also in the Avestan scriptures). ‘Let the slothful slumber on,’ says the rishi. But those who rise with Ushas are promised abundant rewards and the glow of an optimistic outlook. Clothed in shining colorful garments and displaying her wondrous splendor Ushas arrives bubbling with zest and new hope to bring joy to the Earth gracing and blessing the humanity with all the finer qualities of life (Based on Kerr 2010). Like a good matron Ushas comes carefully tending everything; rousing all life she stirs all creatures that have feet, and makes the birds of air fly up. She sends the busy forth, each man to his pursuit: delay she knows not as she springs (Rigveda 1:48.5-6). Because Ushas heeds the voice of everyone living in the Vedic Weltanschauung, prayers in her praise find the pride of place. The inspired poets/rishis that composed these suktas project a consistent excitement of positivism. Ushas urges every living being (all creatures, both, great and small) to motion and to advance towards the goal. She herself sets this example by driving away all darkness and distress, thus bestowing new life each day. Though herself ageless, she diminishes the duration and lifespan of all mortals by each passing day. It is for this reason that meditation on Ushas is so important (Based on Kerr 2010). YBP explains that light is a key spiritual principle in most of the world’s major religions. Ushas representing the beginning of light (the dawn and the period prior to sunrise) is an equally important spiritual principle that has its place of prominence within spirituality as a whole. Ushas being the dawn represents our dawning or spiritual awakening; the shining light of spiritual awakening. This marks the beginning of a greater inward journey towards spiritual realization. In reality, we experience Ushas on a variety of levels, and not just the spiritual level; because the journey of life is a repetitive awakening to new facts and realizations. The spiritual dawn is fundamental to human existence, and for obtaining the goal of moksha (liberation). Each of us has within ourselves the desire to know the truth, though often there is conflict over the aspiration to know the truth and the human ego’s urge for material joys. It is therefore auspicious to invoke the light of dawn, counsels YBP, as we begin the path each day with a mantra such as Om Ushase Namah. YBM anticipates and addresses a question that an alert reader is sure to raise: how does one tap into the divine awakening, which Ushas oversees? His answer is through our own actions, thoughts, and meditation on mantras pertaining to Ushas (satyamantra). Accordingly, YBP introduces names and mantras for meditation on Ushas, some given to him by his guru Mahavatar Babaji as well as lessons from his personal conversations with the guru about Ushas. Chanting of these mantras can serve as a useful tool for strengthening one’s awakening to the light. YBP has compiled and organized two groupings of the names/mantras on Ushas. The first grouping includes lectures on the names/mantras, and the second has lectures about the meaning of the names/mantras including some stories. Additionally, he teaches mudras i.e. hand gestures and positions that are not as commonly known to be associated with Ushas. This is followed by elucidation of the select teachings from the Vedas in order to provide insight into the deeper meaning of key words that allow the meaning of Ushas to come alive. YBP assures the reader that the chanting of sacred names/mantras of Ushas will alter the aspirant’s mind and body. Overtime, they will also produce an effect on his/her astral (energetic) body. Those interested to study Ushas online are invited to visit his website, where an online study program ‘Ushas: 15 aspects of the Divine’ is available. YBP is confident that this study would open the aspirant’s mind to deeper levels of understanding and knowledge of dharma. Understandably, YBP’s primary concern in this short e-book is to offer insights into the spiritual dimension of Hindu dharma with a focus on Ushas. Yet, he is not unaware of the potential for initiating the positive social change that Hindu deities harbor. For instance, he reminds the reader that Ushas is not the weak feminine force commonly portrayed in some patriarchal systems; rather she is a vibrant force, a shakti (power), which is itself manifesting and unfolding throughout the cosmos. A rik from one of the Ushas suktas (Rigveda 1:124.7) alludes to this potential, where the rishi compares the rising Ushas to a ‘brotherless’ widow slowly climbing the steps of the courthouse to claim subsistence and material support. This reference suggests that (1) a woman in ancient India could count on material support from her parental family (more particularly from her brother/s) failing which she had (2) recourse from the state, and (3) the presence of an actively functioning court system in India during the Vedic times. A note of caution: Beware of New Age Spirituality! In the not too distant future, when the print version of Ushas hopefully hits the book stores, YBP will have to make sure that the book will be stacked in the section on Hinduism and not be relegated to the ‘New Age Spirituality’ racks. This caution is necessary because many elements of Hindu dharma are increasingly being coopted in the New Age movement whose flowering coincided with the defeat of the 1960s social and political movements in the West. Furthermore, YBP’s writing style is somewhat akin to that consciously adopted in many tracts produced by members of the New Age movement. His appellation ‘Yogi Baba Prem’ may also elicit a nebulous connection with the New Age movement among his followers. The fact is, in the Indic context spirituality is not about creating a newer-better you. Seeking moksha is not a rejection/amelioration of oneself, but a getting to know the ‘self’ in the most profound way possible. Authentic spirituality is about mindful witnessing of one’s being. New age spirituality, on the other hand, is more concerned with carving out a new, more exotic role for the ego to play in reaction to the excessive rationalization and mechanization of Christian and Western life style and the resultant dissociation between desire and reason. A longitudinal study from 1991 to 1995 suggests that ‘New Agers’ represent a steady 20% of the US population. They consistently stand as the third largest religious group in the US (see J. Naisbitt & P. Aburdene 1990). New Age Spirituality posits itself as a new sensibility to be generated through such alternative and complementary disciplines as ayurveda, astrology, ecological awareness, and as greater openness to non-traditional spiritual paths and alternative methods and lifestyles (See Bauwens 2013). With no coherent philosophy or dogma, it is difficult to define the unorganized New Age movement whose members often cluster around a metaphysical bookstore, a spiritual teacher, or an education center. Because Hindu dharma shares some of these features with the New Age movement, it is easy to confuse the two. I recall many years ago while at Swami Dayananda ashram speaking with a group of HIndu’s [sic] concerned about issues facing Hinduism. I told them that the front line of the issue was with yoga, the reply was “let them have yoga”. It was a disturbing response from people allegedly concerned about Hinduism. If Hinduism does not wake up, it will find that western systems will claim ownership rulership over all the teachings (See Yogi Baba Prem 2013). What do we have in Yogi Baba Prem? A scholar of Hindu dharma or its sentinel? Or both? The verdict rests with the readers of Ushas, the Divine Dawn: Awakening the human spirit and potential! Kerr, Sam. 2010. The Glory of USHA, the Divinity of DAWN. Serialized articles in ‘Manashni,’ the voice of the Australian Zoroastrian Association of NSW, Sydney, Australia. Naisbitt J & P. Aburdene. 1990. Megatrends 2000. New York: William Morrow & Company. Roy, Raja Ram Mohan. 1999. Vedic Physics: Scientific Origin of Hinduism. Toronto: Golden Egg Publishing. Dr Shrinivas Tilak (Ph.D. History of religions, McGill University, Montreal, Canada) is an independent researcher based in Guelph, Ontario, Canada. His publications include The Myth of Sarvodaya: A study in Vinoba’s concept (New Delhi: Breakthrough Communications 1984); Religion and Aging in the Indian Tradition (Albany, N. Y.: State University of New York Press, 1989), Understanding karma in light of Paul Ricoeur’s philosophical anthropology and hermeneutics (Charleston, SC: BookSurge, revised, paperback edition, 2007), and Reawakening to a secular Hindu nation: M. S. Golwalkar’s vision of a Dharmasāpekşa Hindurāşţra (Charleston, SC: BookSurge, 2009).